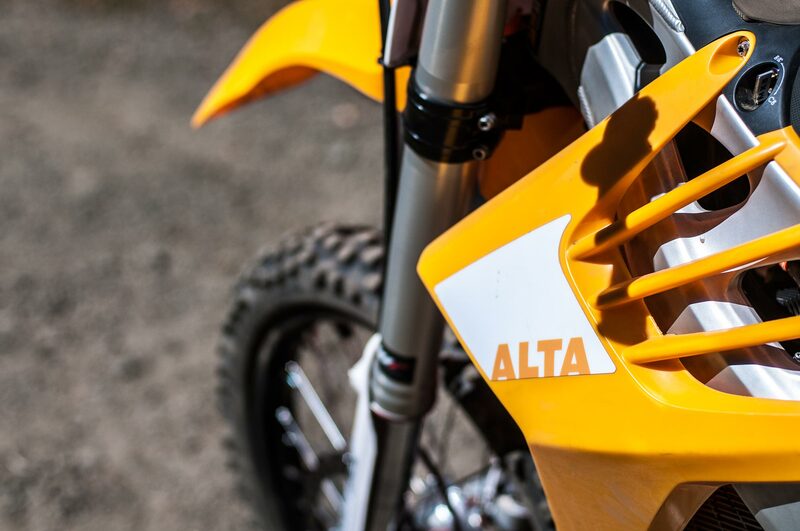 For a long time now, Asphalt & Rubber has been following the progress of Alta Motors (formerly BRD Motorcycles), as they have worked to make a lites-class comparable electric motorcycle. 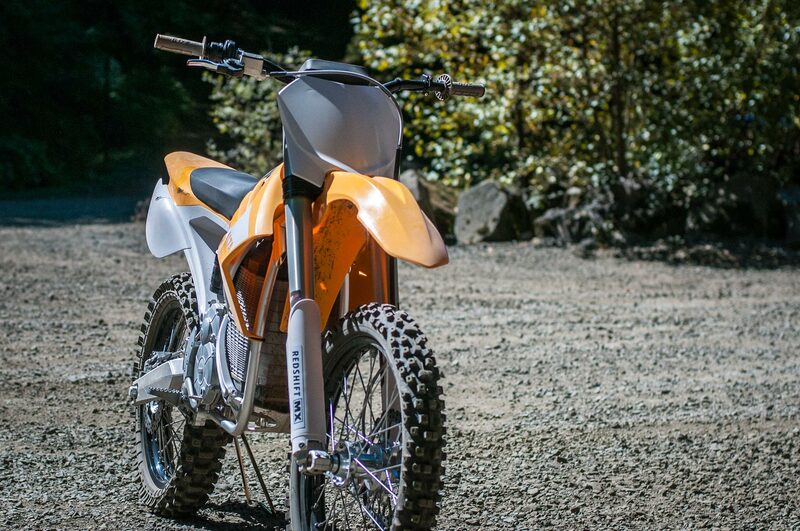 With the Redshift MX motocross and Redshift SM supermoto bikes now shipping from the company’s San Francisco facility, the motorcycle community can finally see in the flesh what I have been calling one of the most competent electric motorcycles yet produced. I have no problems saying I have had a hearty drink of the Alta Kool-aid. I was impressed with the Redshift SM prototype that I rode back in 2011, and the finalized form of the Redshift has only matured further from its strong start. I don’t want you simply to take my biased word for it though, so for today’s post, I have enlisted the help of my Two Enthusiasts Podcast co-host, Quentin Wilson. For those who don’t follow the show (shame on you), Quentin is a former chassis mechanic for the Graves Yamaha AMA team and the MotoCzysz MotoGP project. He is also an accomplished racer, generally go-fast guy, and has a fair bit of electric motorcycle riding experience as well. 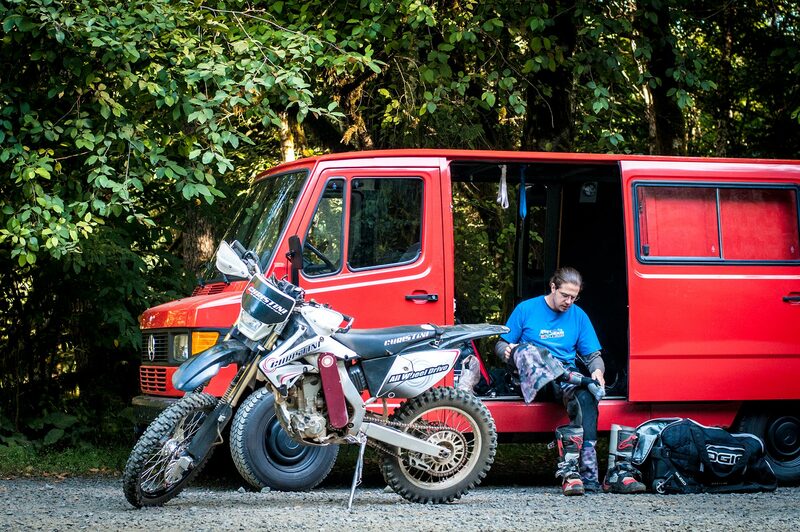 It also helps that he is familiar with the woodsy trails we have here near Portland, as we were riding Alta Motors’ motocross machine for the first time, at the Browns Camp OHV Area. Quentin is like me though: we see electric motorcycles not as an answer to saving the environment, though that is a nice side effect, but instead as a superior method of making motorcycles not only faster, but more rideable. With those two aspects in mind, I asked Quentin for his thoughts on the Alta Motors Redshift MX, after a couple hours of trail riding. As you will see, Quentin’s usual ride is a Christini Honda CRF250X, which is an unusual bike in its own right, but fits into the 250cc class that Alta Motors is targeting right now with the Redshift series. A nice side-effect of being Jensen-adjacent is getting to experience new and interesting things on motorcycles. 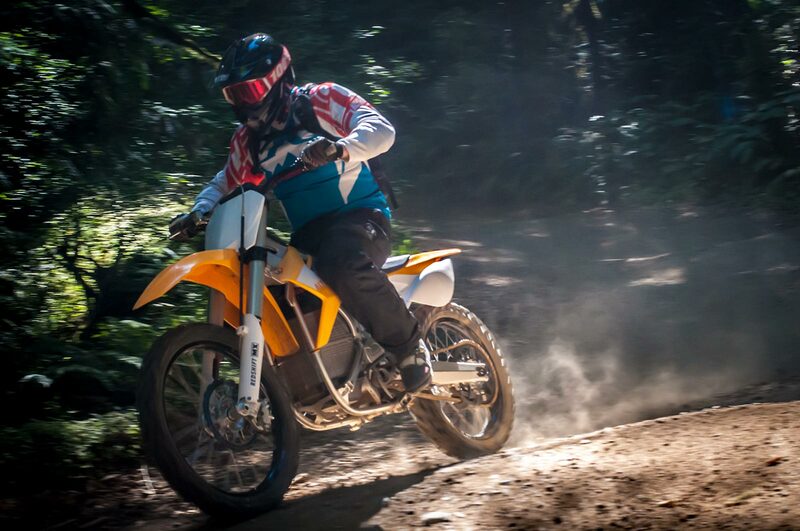 So when Jensen called me up, and told me to take Tuesday off work, so we could ride the Alta Motors Redshift MX in the Coastal Forest, I obliged quickly. Not often do you get to ride a vehicle that only a handful of others have experienced. The series of trails we rode were fairly open, the width of a four-wheeler ATV in most cases, and not too steep. We had access to plenty of loose dirt and baby-head/fist sized rocks, with many of the trails littered with scree and talus. I’m no stranger to electric motorcycles. I worked at MotoCzysz just as it was starting to create its E1pc electric bikes, and I have spent a good amount of time on the Brammo Empulse and also the Energica Ego, so I understood what to expect from the powertrain. I always enjoy riding electric bikes, and very much believe in the technology. Jensen and I both like them not because they are going to “save the manatees” as he says, but because it is a superior method of propulsion to any hydrocarbon-burning mechanism. That being said, I certainly didn’t expect this bike to be as natural as it was, nor as well developed as it was. 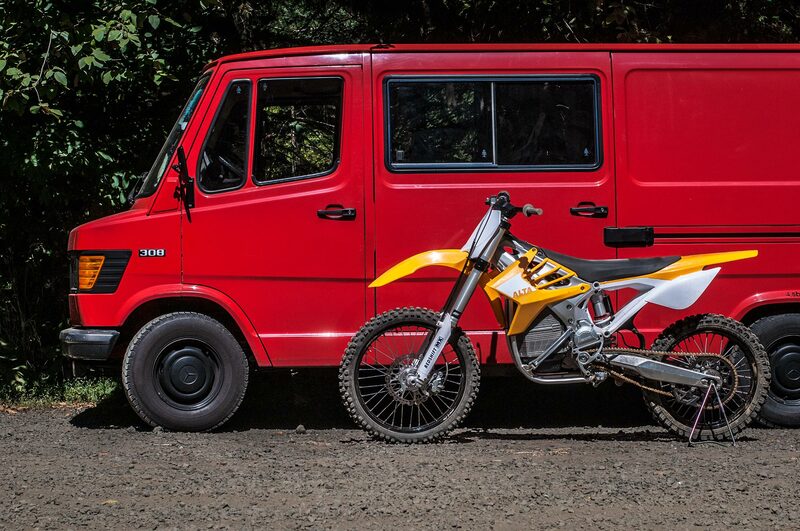 I wasn’t aware that Alta Motors has been in the process of developing these bikes for over seven years, but this fact is reflected in the fit and finish of the bikes, and in the sheer performance potential of them. The Redshift MX is activated your standard kill switch, and then is brought to life with what you could loosely call the starter button. There is an audible click, and then the machine is alive. This is a bit of a freak-out, as there is no running engine telling you that the machine is live. Frankly, it is just like a drill motor sitting on a bench; if you accidentally bump the throttle in this mode, it spins the rear wheel. This takes some mental adjustment. Another adjustment is that the handlebars are very bare, with only a grip and a map switch on the left side, a throttle and a kill switch assembly on the right. I eased off in Map 1, which delivers 75% of the power to the wheel, has a more forgiving throttle map, and has the highest amount of traction control intervention. I was immediately comfortable. I didn’t even notice the lack of clutch/shifter, and went right into rippin’ n’ tearin’ mode. The bike handled beautifully, soaking up all the bumps and rocks, and it allowed me to get the power on with ease, and collect the bike on the brakes with no undue drama. In Map 1, I wasn’t able to spin the rear as much as I would have liked, and I wasn’t able to squirt over small rolling bumps, so I stepped things up to Map 2. That hit the spot. Even in Map 1, I was getting myself into trouble by accelerating more than I am used to with my Christini. Map 2 allowed more chassis control during the acceleration phase. Like most veteran riders, I have been conditioned over the past 24 years of riding to expect a certain amount of control from a clutch and a gearbox. In one 20-minute riding session, I was able to forget all that and just concentrate on acceleration and braking. My requests for torque are based on repetitive use of a piston engine, with a clutch and a variable power band; to then have access to immediate torque in a super linear manner, at all times, was mind boggling whilst being incredibly easy to adapt to. Riding the Redshift MX is fairly simple, you request forward motion with your throttle hand, you get it and it is doled out exactly as you have metered it in degrees of rotation. No muss no fuss, just acceleration. 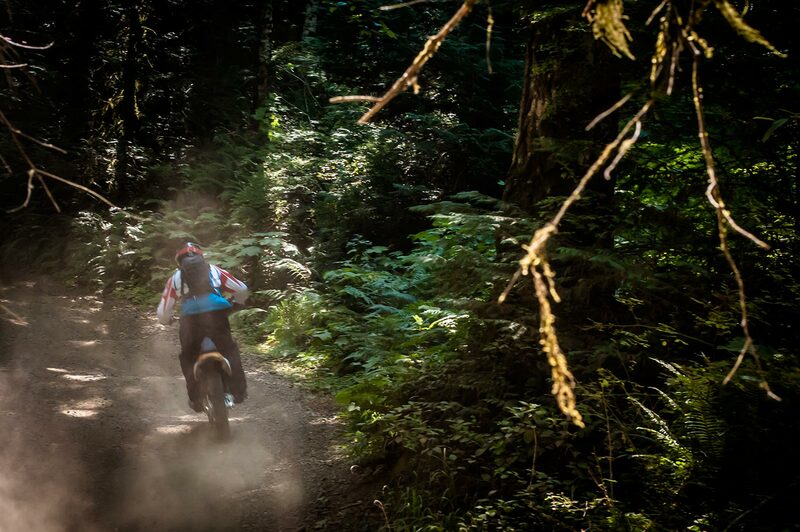 Riding in the woods, as we were, it was hard not to be distracted by the lack of handguards and other enduro-related equipment. The 19-inch rear wheel was noticeable for its abillity to grip-and-rip in certain conditions, but it didn’t provide as much feel as the 18-inch with the larger aspect ratio that I am accustomed to. This brings me to a comparison, which is admittedly bizarre. I have a Christini Honda CRF250X… with an all-wheel-drive mechanism that transfers its motive force from the engine to the dirt via both wheels. This has been my personal dirtbike since 2009, though prior to the Christini, I had a Honda CR250R two-stroke with an RPM 265 kit. For the past few years, I have also had a highly modified Honda XR650L with CR500 forks and some other lightening mods. I haven’t been on a motocross track for years, I just ride trails. 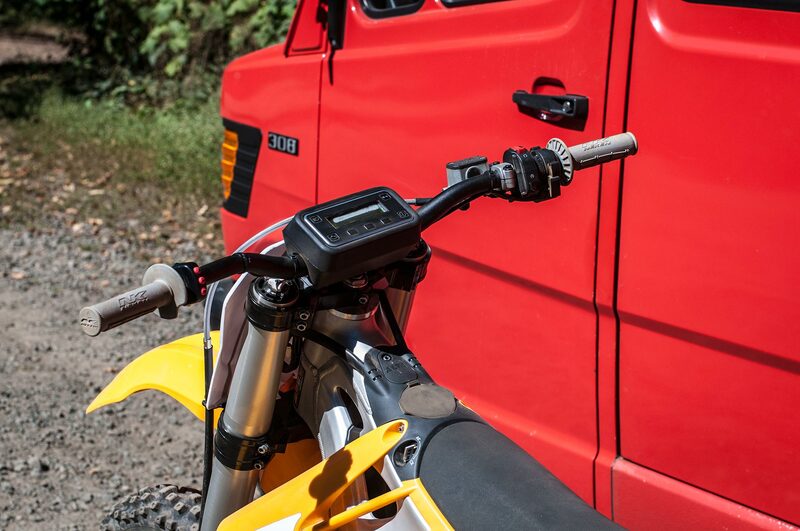 The Christini Honda CRF250X and the Alta Redshift MX have a similar power output, but certainly not a similar power band. The Alta is about the weight of the Christini sans fuel (add 15lbs of fuel to the weight, when topped-off), but this is about where the commonalities stop. Unlike my Christini, which carries most of its heft in the front of the bike (where the all-wheel-drive kit is located), the Redshift MX’s weight is concentrated in the center. 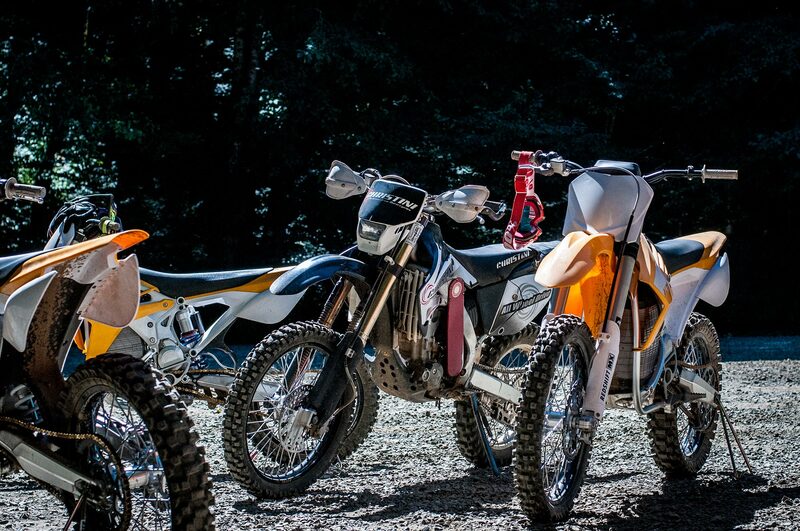 This makes sense, as the Redshift MX is obviously set up to favor track use, but was surprisingly adept at handling the rigors of trail riding. The WP Suspension fork and shock are the latest and greatest from that company, which is what you would expect with Alta Motors’ premium price point. Still, the fork was very harsh, and was inclined to reward more aggressive riding. Once I got the speed up a bit, the forks started feeling pretty darn good, though I would still prefer a bit more of a plush feel, instead of something that deflected off of baby-head rocks in a disconcerting manner. 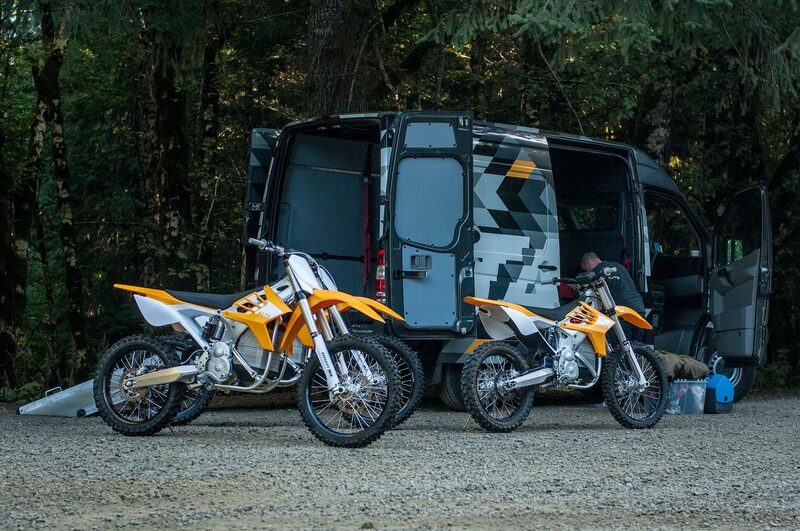 This is the behavior of a chassis made for circulating groomed tracks with large jumps, and is something hopefully Alta Motors considers while they consider making an enduro model of the Redshift. That being said, the rear felt good no matter what. Frankly, the suspension and chassis troubles seemed to be something that a little oil-height correction would take care of, nothing revolutionary. The brakes are superb, as was the steering, but it was the chassis attitude under acceleration that was most impressive. If we look at things from an electric-to-gas standpoint, one thing I did miss on the Redshift MX was the lack of engine braking, which is actually quite a large part of any experience. I wish I could tune the regeneration to have a bit more resistance on the fly, though it should be noted that the different throttle maps do have different levels of regenerative braking, which mimics engine braking. The last bit of our ride we did a couple of miles of dirt forest service roads, which naturally became an impromptu flat-tracking romp. The traction and feel of this bike at speed was superb, again a testament to the chassis, and the experience made me want to set the Redshift up for proper flat track racing. I was very excited to ride this bike and it didn’t disappoint, in fact it exceeded expectations. 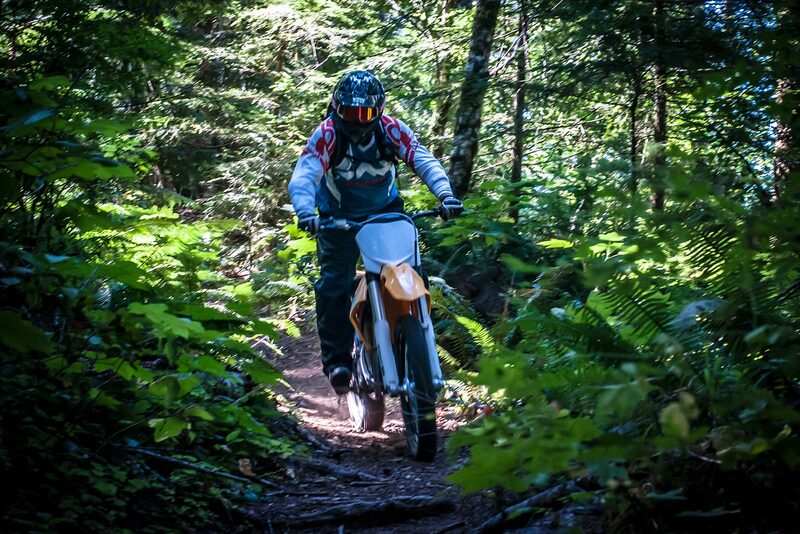 I would love to get an enduro version, a generator, and head out to Eastern Oregon for a longer test. The “Not-A-Review” series of articles focuses on bike reviews where the time/duration, experience, or subject matter is something that falls outside of Asphalt & Rubber’s standard for a proper motorcycle review. As such, these stories are meant to be more like guiding lights to a larger opinion we are still forming journalistically here at A&R. When possible, we will f0llow-up these stories with proper in-depth reviews that A&R readers are more accustomed to seeing from our publication.